52 by 48 in. 132.1 by 121.9 cm. 97 by 44 in. 246.4 by 111.8 cm. 83 by 44 in. 210.8 by 111.8 cm. 82 by 44 in. 208.3 by 111.8 cm. 76 by 44 in. 193 by 111.8 cm. Mitchell-Innes & Nash is pleased to present our second solo exhibition of Los Angeles artist Amanda Ross-Ho. Ross-Ho has exhibited widely in museums and galleries worldwide. Her recent solo exhibition at the Los Angeles Museum of Contemporary Art was accompanied by a comprehensive catalogue. Her work has been included in exhibitions at the Museum of Modern Art, New York; Orange County Museum of Art, Newport Beach; Pomona College Museum of Art; Henry Art Gallery, Seattle; and in the 2008 Whitney Biennial, among many other institutions. 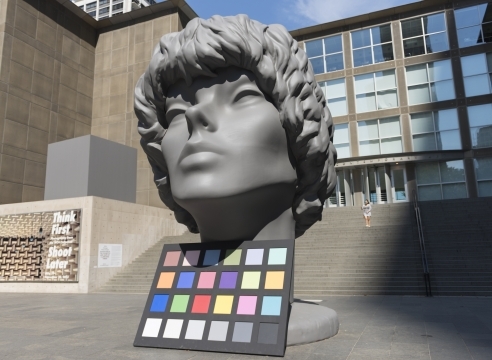 The Museum of Contemporary Art in Chicago will present a major outdoor project later this year, THE CHARACTER AND SHAPE OF ILLUMINATED THINGS. Ross-Ho was born in Chicago, and lives and works in Los Angeles. GONE TOMORROW presents an evolution of specific terms within Ross-Ho’s personal language. Translations of textiles, jewelry, and found images that have featured prominently in her work now loop back in transmuted forms. GONE TOMORROW continues to scramble and hybridize the genetic code that forms her work.